Apples of Gold Jewelry brings you another beautiful pendant that she will fall head over heels for with this 14K gold cut-out heart slide pendant! 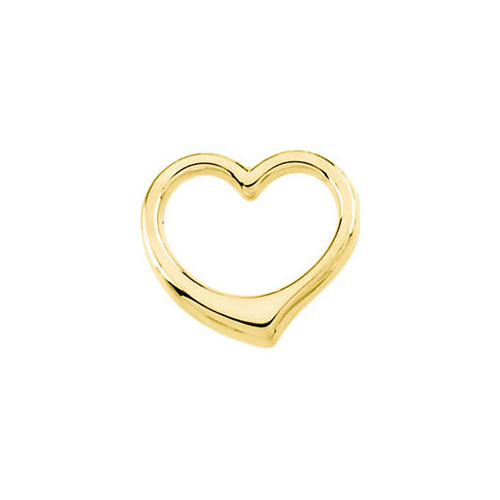 Featuring a simple cut out heart design, and crafted from 14K yellow gold to add a bit of a glow to the pendant, this is definitely one you will want to add to your jewelry collection! Sized at just 1/2 inch in size, this cut-out heart slide pendant is perfect for adding to any look, and will instantly become a favorite due to its versatility and sophisticated look. We guarantee our 14K Gold Cut-Out Heart Slide Pendant to be high quality, authentic jewelry, as described above.